Check in weekly, on Wednesdays, to read our new post on gardening, harvesting, and making use of that fine, extra-local produce! We’ll share tips and techniques, gleaned from our urban farms and gardens. Email info@growpittsburgh.org with any topics you’d like us to cover. Herbs are a great plant for urban gardens. They can handle growing in small pockets of space – tuck them into edges of garden beds, or plant them in containers. Herbs generally tolerate rocky or less than ideal soil, and they can handle drying out a bit more than vegetable crops. Herbs are an economical crop to grow, as they can be pricy at the grocery store. Fresh herbs from the garden are also packed with flavor and nutrition! Some herbs, like sage, thyme, and oregano, are perennial, meaning that they come back each year. Some are annual, like basil and cilantro. For a more thorough list of perennial and annual herbs, check out this article from the archives. Compared with many of their vegetable counterparts, herbs can seem tricky to harvest. Most start out with the growth habit they’ll continue to have throughout their life, and just get bigger. So what part should you harvest, and how do you go about harvesting from an herb plant? Harvesting dill by trimming the largest outer leaf. Once herbs are transplanted, allow them to begin developing new growth before harvesting. For direct-seeded herbs, wait for the plant to develop several sets of leaves before harvesting. When harvesting any herb, be careful not to remove more than 1/3 of the plant at a time. 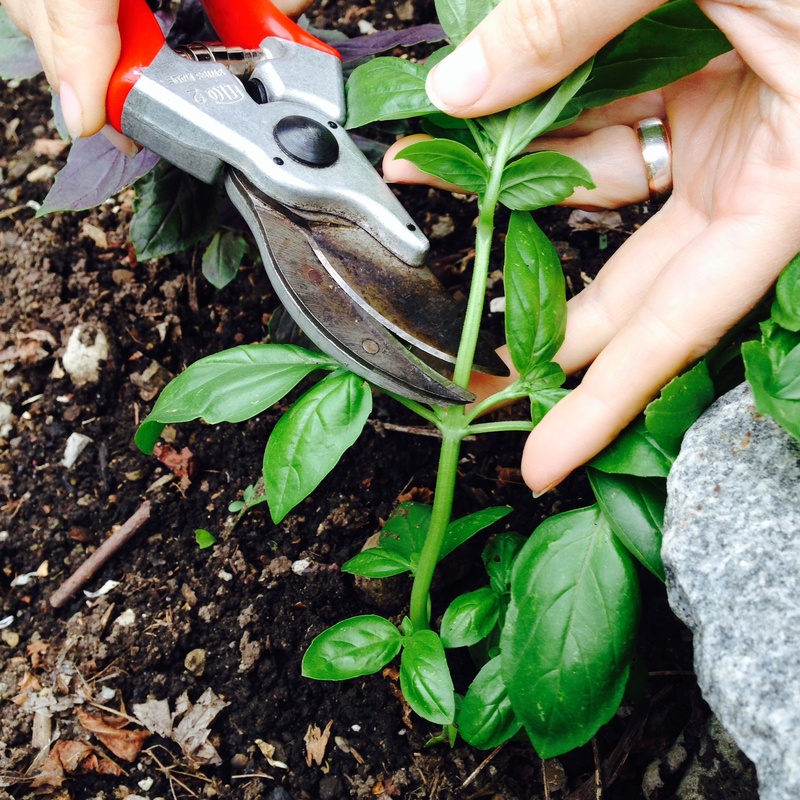 We recommend using a sharp pruners or scissors to trim herbs. Think of harvesting as pruning. Therefore, take parts of several stems, or stems from all over the plant, rather than harvesting from just one area of the plant. Herbs that are flowering can still be cut and used but the flavor of their leaves will be milder than usual. Herb flowers are edible and can be used in salads or as garnishes. Leave the flowers to attract beneficial insects, or to encourage leafy growth, trim back flowers as they appear. Harvesting basil by trimming the main stem above a leaf cluster. For herbs that have long stems with leaves at the top, like parsley, cut the oldest, outer stems at the base. For herbs with bushy growth, like thyme, oregano, sage, and mint, and slow-growing herbs like rosemary and lavender, trim whole or partial stems from multiple areas of the plant. To harvest basil, trim a main stem, right above a set of leaves. The plant will then create more stems and more sets of leaves. 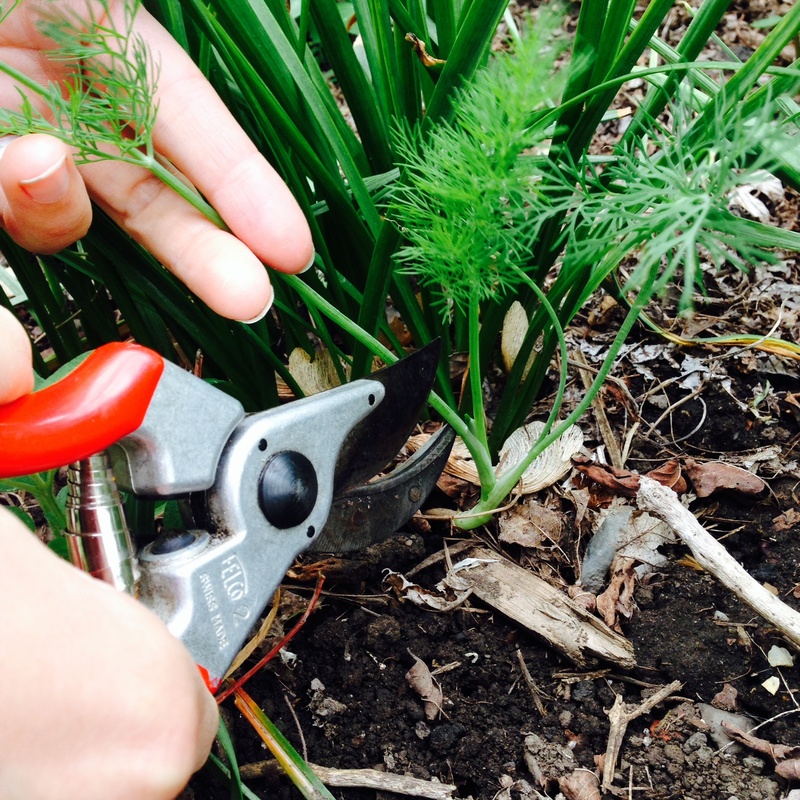 To harvest dill and fennel remove side branches as fronds are needed. At some point in the season, flower heads will form at the tops of the plants. Allow these to develop green seeds, then trim the heads for use in pickling. Or, to save dill seeds for planting or culinary use, clip the whole seed head when the seeds are light brown, and hang upside down in a paper bag to dry fully. To harvest cilantro, trim the top 1/3 of the plants regularly, which will encourage more leaf growth. Cilantro is short-lived and will develop flowers and then seeds, which are coriander. To harvest coriander, clip green seeds to use immediately, or allow seeds to turn brown. When the majority of the seeds are brown, clip the plants and hang upside down in a paper bag to dry fully. For borage, chives, and lovage, trim leaves as needed. Use fresh herbs in cooking or salads, tea, bouquets, or as a room freshener. Herbs can also be preserved for use year-round. Keep an eye out for our next Urban Harvester article, which will outline some common preservation methods for fresh-cut herbs!